Libya's Supreme Court has ruled that dozens of people jailed for belonging to an outlawed political group should stand trial again. The Muslim Brothers had appealed over the cases of 85 members arrested in the late 1990s and tried by a court deemed illegal by human rights groups. 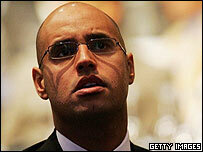 They were found guilty of supporting a political party, a punishable act under Libyan law. Some were jailed for life. The retrial offers them their first chance to appeal against the verdict. The 85 prisoners of conscience, many of them students or university academics, were originally tried by the People's Court, which was abolished earlier this year. They are serving sentences ranging from 10 years to life imprisonment and, in some cases, the death penalty. Developments this year have prompted speculation about their plight, says the BBC's correspondent in Tripoli Rara Jawad. The prisoners were due to be released under an amnesty according to claims by Seif al-Islam Gaddafi, a son of Libyan leader Col Muammar Gaddafi. In a recent speech, Seif al-Islam Gaddafi said the Muslim Brothers would be set free because they were rehabilitated and no longer posed a threat to national security. Human rights groups including Amnesty International have been lobbying for their unconditional release. Although they may not be walking free as some campaigners would have hoped, the prisoners will at least now have their day in court.